My garden project for August and September is to dig and plant the flower beds immediately surrounding my new patio and walkways – most of the entry garden (around the front entrance to the house) and the Lavender Walk. I got the tiny Blues Border done as a break in the middle of the paving stone project. 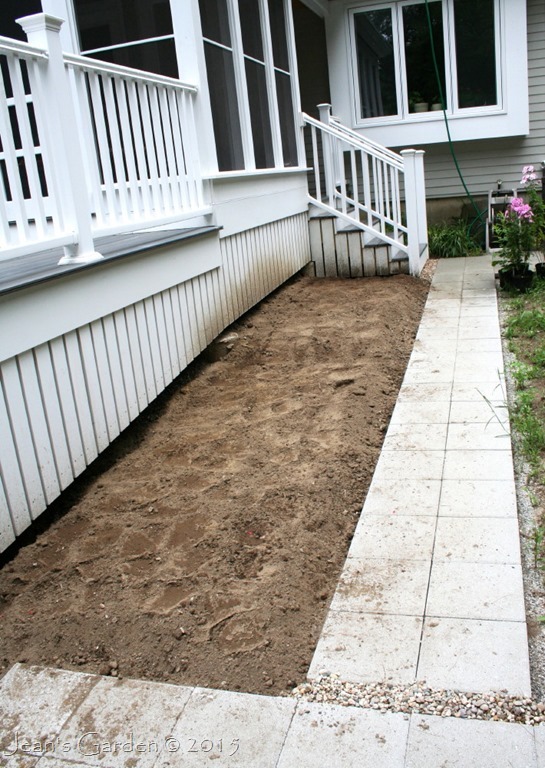 Once I completed the hardscape, I got to work on the first major section of the entry garden, the 18’ x 4’ Porch Border that fills the space between the walkway to the patio and the porch and front deck. I finished digging this border on Wednesday morning. Because I must amend my sandy soil heavily to make it garden-worthy, the level of the dug flower bed has been raised about eight inches. I tamped it down with the back of my shovel and then left it to settle. On Thursday afternoon, with five days of rain in the weather forecast, I decided to get plants in. My design for this border (shown below) calls for flowers in the pink/lavender range, with a succession of blooms from late spring (hardy geranium and heuchera at the front of the border) to autumn (phlox and New England aster at the back). I’ve also chosen fairly tall plants, from 2’ at the front of the border to 4’ or more at the back, because I want this planting and the one that will go on the other side of the walkway to provide some sense of enclosure for those approaching the front door. The plants for this border are a combination of newly purchased plants, plants from my holding area, and divisions of plants from elsewhere in the garden. 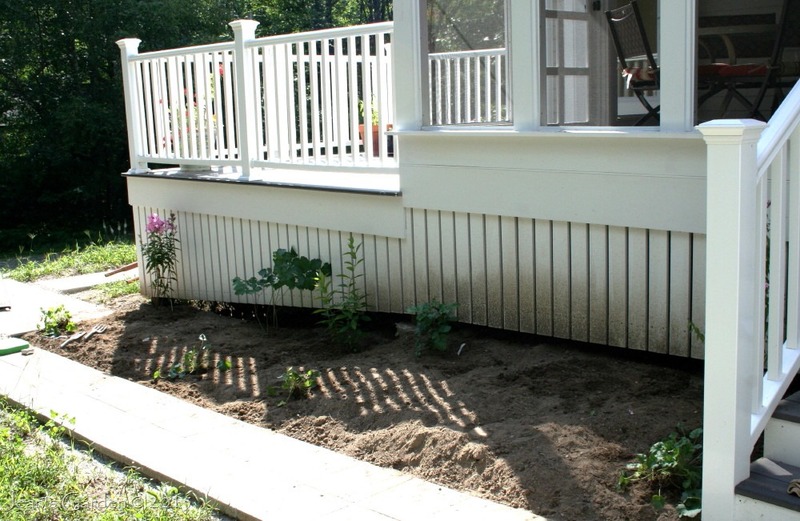 I began by planting my three recently purchased Phlox paniculata plants at the back of the border (‘Bright Eyes’ near the front steps, ‘Robert Poore’ in the center, and ‘Miss Pepper’ near the patio). Then I added two plants of the tall Astilbe thumbergii ‘Moerheim’s Glory’ on either side of the central phlox. This plant is a vigorous grower and has graceful inflorescences of palest lavender. One of these was newly purchased and the other was a division from a plant in my deck border. The large spaces between the astilbe and the phlox plants on either end of the border are for plants of New England aster ‘Alma Potschke’, which I hope to purchase and plant next week. 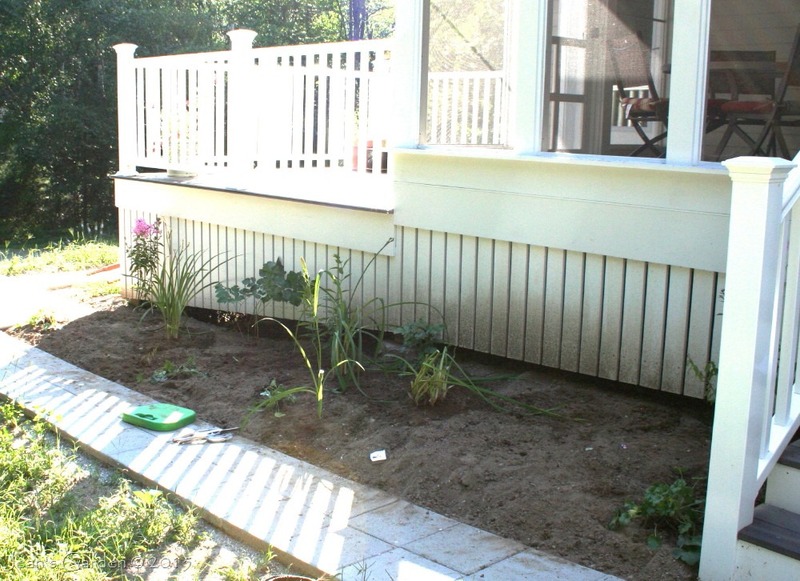 Once the back-of-the-border plants were in place, I moved to the front. My plan called for four plants of Heuchera ‘Raspberry Regal’. I had an existing plant in my holding area that I thought I could divide in two, but I had been having trouble finding a source for two more plants of this older cultivar. When I dug up my existing plant, however, it conveniently fell apart into four pieces, solving the problem. My next step was to add daylilies, two groupings of three each. Four of these simply needed to be transplanted from my holding area. The other two needed to be divided from plants in other parts of the garden. The group closest to the front steps (near the middle of the photo) includes ‘Final Touch’ at the front and ‘Lily Munster’ and an unidentified deep pink cultivar behind. The other group includes ‘Protocol’ at the front and ‘Caribbean Pink Sands’ and ‘Mariska’ behind. ‘Protocol’ and ‘Caribbean Pink Sands’ were a bit difficult to find in my holding area. They were not happy residents of that temporary home and were shadows of their former selves. I think ‘Protocol’ will recover; ‘Caribbean Pink Sands’ may need to be replaced next year (easy enough to do with a daylily nursery, Grenier Gardens, just four miles away offering large clumps for $6!). My final step was to take three divisions of Geranium x oxonianum and two divisions of Tradescantia ‘Pink Chablis’ from elsewhere in my garden and add them to the front of the border. With these plants in place, I gave the whole planting a good watering. The several days of intermittent rain that are forecast for us (and that began last night) should help all these plants get settled in their new homes. 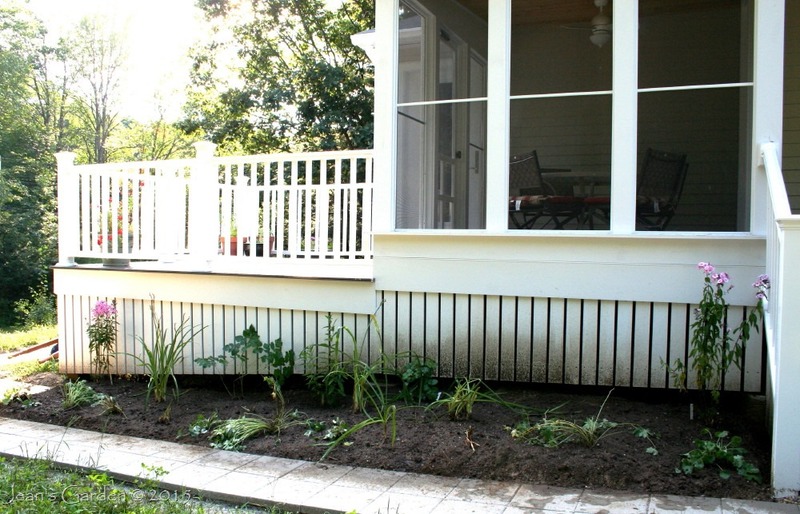 Next week, I will move around the corner from the Porch Border and begin work on the Lavender Walk. expecting rain on Sunday, tomorrow I’ll follow your example and get the next lot in. Progress! I like your planting plan, Jean, and I look forward to seeing it in all its glory next year. In the meantime, it already looks as though the plants are settling comfortably into the new space. Kris, Right now some of the plants (especially the newly divided geraniums) are looking pretty droopy, but I can look past that and imagine how lovely they’ll be next year having had this fall to get settled in. Thank you. It feels good to be making progress on these flower beds. I love watching your progress, this is such a great gardening tutorial. Charlie, I’m a “slow and steady wins the race” type of personality, so my gardening is almost always a gradual, methodical process. Glad to see you are making so much progress. A project like that makes you appreciate all that rain instead of wondering how to dry out a soggy house like I do. Your plants are getting good consistent dousings! Now I’m looking forward to seeing the porch border next year in all its glory. Nothing beats a new project does it?! Claire, I was happy to notice today that the two daylilies that were in such bad shape when I transplanted them are putting up new foliage growth, a promise of glory for the porch border next year. Hooray! Jean, with a little color from the phlox already giving a tiny taste of the glory to come, I know how excited you must be to get this border planted. With the promised rain, all these plants must be settling nicely into their new homes. I look forward to seeing what this looks like next year! Deb, I’m hoping to get still more color here in the coming week as the third phlox begins to bloom and as I add the New England aster cultivar ‘Alma Potschke.’ Next year, not only will this border have filled in some, but it will be accompanied by additional plantings in the Patio Border across the walkway and the Lavender Walk around the corner. Oh, the before and after photos are fun! And your ‘after’ will be even better by the end of next summer. Best wishes for your newest garden. VW, I just got the asters planted today, so all the plants for this border are now in. I’m excited to see how it will look next year. Looking forward to seeing this garden next year. You picked a great selection of plants! Jason, I’m looking forward to seeing it next year, too. :-). Sometimes I’m not sure I have the patience to be a gardener! I love your vision. What zone are you in? Jean, I’m on the border of zones 4 and 5. The new maps all put me in zone 5a, but we it’s pretty normal here to get some winter temperatures below -20, which are zone 4b temperatures. We usually have enough snow cover in mid-winter to protect plants from extra-cold temperatures, so I take the risk and grow quite a few zone 5 plants. Jean I really like the color scheme and height of this garden. The plant choices are perfect and I look forward to seeing this garden bloom next spring and summer. Exciting moments, those of the start of a new garden. Everything looks so promising! now is time to wait until next spring. Though hard, great work! Hi Jean, it’s so exciting planting and filling a new border, even more so after slogging through the hard work needed to create a border suitable for planting in, in the first place. I know the plants look sparse and droopy now but they should pick up and fill out before you know it! Sunil, After just a few weeks, they are already showing new growth. By getting them in at this time of year, they can get a head start on new growth next spring.